Survival situations are definitely not fun and games. Well, for a certain kind of misanthrope they are, but they definitely aren’t fun for 99% of us. The stresses of surviving, enduring and under the circumstances thriving a major event will be hair-raising, no doubt about it. But that does not mean you should completely shun the idea or entertainment and recreation in your planning and preparation. To the contrary, for any long- or unknown-duration crisis, especially ones that are comparatively less severe than other potential happenings, recreation and leisure activities are important, especially when surviving in groups or as a family. Humans, all of us, must have some way to relieve stress, some kind of pressure valve. While you likely will not be able to indulge all of your hobbies or take that vacation you always wanted after the onset of a major crisis (unless austere living or bugging-in is considered a vacation), with a little knowledge and a few helpful items you can have everything you need close at hand for a little bit of entertainment. In today’s article, I’ll be talking about the importance of having a little fun in the midst of a really bad situation, why it is important to your overall success, and offering a list of games and other things you can partake of when you and yours need some entertainment. The popular image of people who have the rotten luck to be enduring a crisis is one of abject misery, drawn, haunted faces, and a distinct lack of fun. The notion is that surviving will be a grueling or exhausting task, one where all efforts and energies are directed solely to hanging on to what you can, including your very life. This image certainly underscores the seriousness of a proper disaster, and what is at stake, but it does not account for all ends. While certainly possible, even probable, depending on the situation, this version of survival is often predicated upon the assumption that any event bad enough to be dubbed a “SHTF-grade” one will leave you dazed and reeling in the wake of a shattered home, city or country, and your day-to-day existence will be reduced to skin-of-your-teeth subsistence, if that. Again, plausible. But not the only way things can go down. Another potential outcome is one where an event of moderate intensity but long or indefinite duration has effectively turned society upside down, creating a new paradigm for daily life. However different this new day is from the old, there will be opportunity, and need, for stress relief. Consider weeks and perhaps months of drudgery minus all the enjoyable activities, comings and goings that most people count among life’s pleasures. If you have prepared well and are just a little fortunate, the worst you may be facing could be protracted stays at home or at some other location, one where you at least have shelter, an ample supply of food and water. Thank God and good on you. That is what we all hope for. The problem is, aside from daily tasks that must be completed, you will likely not have much else to do to fill your time. In kinder times, we could fire up YouTube, go to the movies, head out shopping, play sports, or do any number of things. Plainly, the majority of those activities will be history or completely unavailable for any number of reasons for the duration of the crisis. Before you “tut-tut” and wag you finger at me for even bringing up something as plebian as entertainment in the context of prepping, and remind me that you are harder than woodpecker lips and don’t need no stinkin’ entertainment ‘cause we survivin’, take just one second to consider who may be with you: your significant other, your children, other family members, neighbors, or simply members of your survival group. There will be a need for stress relief and camaraderie if the situation persists and permits it! Persistent stress nibbles away at the mind, corroding reason and morale until a perfectly normal person is rendered a perfect basket-case, unpredictable and not much good to anyone. Games and other activities are excellent for both bonding and stress relief during rest times. The social value of all kinds of simple games should not be underestimated, as this little bit of fun and normalcy can go a long way toward maintaining group cohesion and morale. You probably have a half dozen questions or admonishments on the tip of your tongue right now, and I plan on addressing at least half of them in the following sections. So keep your safety on and keep reading. Why Not Spend Time More Wisely? That’s the point: in the right circumstances, you are spending time wisely. Assuming you are not 24/7 hustling to merely keep your head above water, literally or figuratively, you will have time allocated for rest. You can rest, and at the same time also engage in a bit of play with whoever you are with, or even just yourself in the case of some single player games. Sometimes you will, frankly, be sitting pretty thanks to your hard work prior to the occurrence of whatever disaster everyone else is presently dealing with and you won’t have so much to do. What’s that? There is always something to do, you say? That’s true, you could always chop more wood, gather more food or be doing something, anything, to be improving your situation that much more. Sharpen your knives, clean your guns, something! But if you want to split hairs, but let’s consider an alternate outcome to this parable for a moment: nothing happens in a vacuum. If you were securely and safely sheltered, wherever that might be, with an ample supply of all commodities and otherwise little to worry about except enduring the current troubles, ask yourself if the risk of activity is worth the gain? Chopping wood means swinging an axe or maul, both two great tools for hurting yourself. A scouting foray could lead to becoming lost, twisting an ankle, or being overtaken by bad guys. Other examples abound. As a caveat, you chances of being able to play a game, any game, during a crisis are largely predicated on the specific situation you are dealing with. A mad scramble to get out of town and stay ahead of danger will leave little time for recreation until you are safely evacuated. A prolonged “bug-in” resulting from a natural disaster, major blackout or societal ills will afford much more. The type of game too will play a part on timing. Classic board games that we all grew up with require a certain amount of space, setup time, a smattering of pieces and everyone understanding the rules. Games utilizing playing cards require only the cards, a nominally clear surface and all of the players to understand or be willing to learn the rules. Some games can be played with something as simple as a piece of paper and writing implement. Some simple games need nothing at all, and are at least good for entertaining young children. My basic rule of thumb is larger board games are only kept at home for bug-in and shelter in place situations. I am not hauling any fullsize board game all over creation resplendent with a zillion jangly, easy to lose pieces. No way. Instead, for carry in a BOB or Go-Bag, I will keep a simple deck of cards, which are useful no matter whether you stay put or head out, or stash a tiny, fold up travel size version of a game like checkers, chess, battleship or something similar in a tin. When choosing what actual game to play, consider how much time you have to devote to a round or session, the players (young, old, competitive or not, etc.) and other factors. Some games are just not much fun, like Monopoly, which invariably turns into a grinding mudslog with one inveterate cheater somewhere in the group. Risk is much the same, only with endless dice rolling and no decisive victory. If you and yours though historically enjoy these games as a group, they may still be worthwhile for the sense of normalcy. Instead, games that play briskly, and feature a degree of luck will help ensure that games end in a timely fashion and fun can be had by all, or at least most. Card games are good for this, as a few hands can constitute a session. I especially appreciate and enjoy card games (even though historically I am terrible at them) because their social component of teaching, learning and bantering is priceless. Another option for on the go gaming is a simple pad and pen. What? Sure. A piece of paper and pen can allow you to play several engaging games, from hangman to battleship. This requires almost no setup, and can be resumed or abandoned at will with no loss of progress. Ultimately, where there is a will there is a way, and all but the leanest and most ascetic loads cannot make room for a deck of cards or a tiny travel game, should you want to include it. On the topic of games for whiling away the long hours during a crisis, none are more divisive than electronic games. Larger units like dedicated consoles and PCs require too much power to be considered for use. If you are able to freely play on your console or computer, than your particular situation may not be quite so serious. Of more interest are the games installed on tablets and smart phones. If you are employing either device as a potential tool to help you prevail and survive, burning what may be extremely limited battery power by playing a game is inexcusable; you should be conserving it as the precious resource it is! On the other hand, if you have a ready and reliable source of renewable power (solar, grid, thermoelectric, etc.) then this is probably allowable. Just keep in mind that nearly all of these games feature sound as one of their primary features, and so consider headphone or earbud use mandatory. The addictive and rapturous dings, pings, jingles and explosions that make these games so compelling is highly likely to grate on the nerves of anyone not playing, far more than the click and clatter of game pieces and dice or the gentle shuffle and sussur of playing cards. I have gathered quite a collection of various games that you can play, some are full board games with a survival bent, and others require little equipment and setup, making them ideal for play when you don’t have or don’t want to commit to an actual tabletop board game. The list features games of all stripes: card games, board games, and pen-and-paper games, so there is sure to be something here for every taste and number of players. I have organized them into categories: Board Games (suitable for travel), Card games, Camping/Scout Games, and Pen-and-Paper Games. You will find under each game a brief description of how to play each as well as some info on adapting or improvising them from what you have on hand. A thrilling spin on the well-trod zombie survival genre, Dead of Winter is what you might call a Co-Adversarial game: the players are all trying to win together and survive by managing and fortifying a home base, obtaining supplies and avoiding or dispatching zombies, but they also have a second, secret objective that they must complete in order for an individual win. Sometimes this objective is in opposition to “team” wants and needs, or even covertly hostile, making for a pretty exciting clash of personalities and ulterior motives… Just like real people. The detail and nuances in managing a group of survivors and their shelter, right down to removing trash and refuse to prevent pestilence and keeping barricades up to snuff, makes for a fun strategy and management excursion. The Machiavellian nature of the secret objectives also ensures plenty of conflict, paranoia and scandal. An absolute blast. In Pandemic, a world-wide outbreak of several hideous diseases has players taking on the role of one of several disease containment specialists, who then must proceed to various hotspots to contain and simultaneously research the bugs for a cure. A variety of randomly drawn cards either help the players with various abilities or result in the diseases mutating or otherwise becoming more problematic. If the diseases spread too far the players lose, but if they manage to develop cures for all four plagues then they win. This game is easy to learn, and its cooperative strategic depth makes it enjoyable for all kinds of groups. A sobering portrayal of war and its effects, with players taking on the shoes of civilians trapped in a besieged and war-torn city. Hiding in their shelled and half-ruined tenement house, players must gather supplies, improvise and construct items they need and go forth to explore the dangerous and ever-changing remains of the city. Along the way, you meet a cast of motley characters, from soldiers to victims and outlaws, who will present the players with unique narratives each play through. Bandits and raiders will be fought, and you’ll struggle grimly against encroaching death. Excellent, but fairly depressing. Enjoyable with the right group of people. These two forerunners of Western board games need no introduction. Both lend themselves to easy travel, as both can be readily found in miniature travel form ready to go or as part of a multi-game set, or improvised from all kinds of found materials. Any flat surface that can be marked or carved can be made into an 8×8 chess- or checker-board, and you can handily make a set of either from paper using small cutouts for your pieces. Chess pieces and checkers can also be fashioned from items you likely have in abundance and close at hand: coins, washers, pebbles or caps for checkers, and various matched sets of implements for chess. One especially good item for chess is various sizes of cartridge ammunition. All collectors of guns have done this, and don’t let them lie and tell you otherwise. Ask me how I know! Games that require a simple, bog standard deck of cards. Obviously, you’ll need to know the rules of whatever kind of game you want to play, or make some up, but that is part of the beauty of cards: everyone knows how to play something, and they were usually taught by someone else. 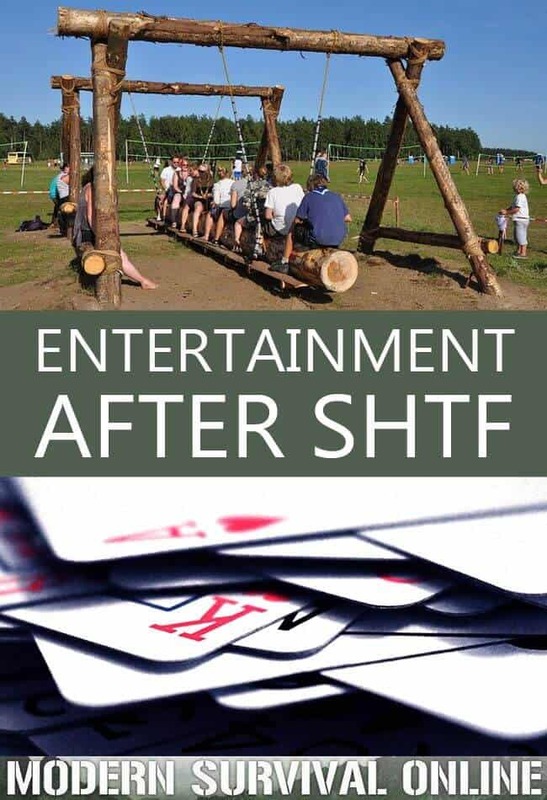 This personal provenance of how they learned a game, learned to play well (or not) and how they pass it on makes them a great tool for bonding and social situations of all kinds when you are cooped up with other people. Card games may be more or less complex and require differing amounts of strategy. You can always learn several, or a couple variations on one game. Games which require betting as part of the strategy of the game can make use of any small tokens of varying value. Solitaire (Patience) – One of the rare card games that can be played solo. Unknown to some, can be played head-to-head using a points system or as a race. The objective is to manipulate the cards in such a way that they are arranged in a certain order according to preset rules. Poker – Poker and its variants, especially the blazingly popular Texas Hold ‘Em, are among the most popular games on earth. The essential components of calculation, betting, bluffing and other psychological factors make Poker a nuanced and rich game ideal for small groups who all know how to play. 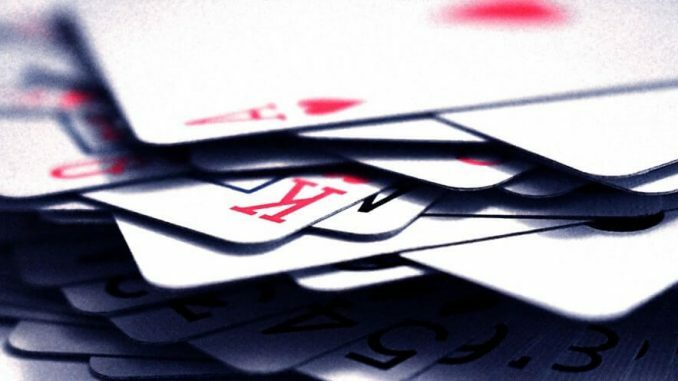 Blackjack – Another popular and somewhat simpler game than Poker, one that requires a “house” player. Less decisively adversarial than Poker, and easier to learn quickly. Cards in the Hat – A fun game of skill and concentration, but one that is mildly abusive on the cards. You can play this one solo or with others, either individually or on teams. Simply put, cards are tossed or flicked at a hat or other receptacle for points. This is far from easy, and is akin to darts with the finesse required for success. Games of skill designed to be played with items you have on you when camping, hence the name. 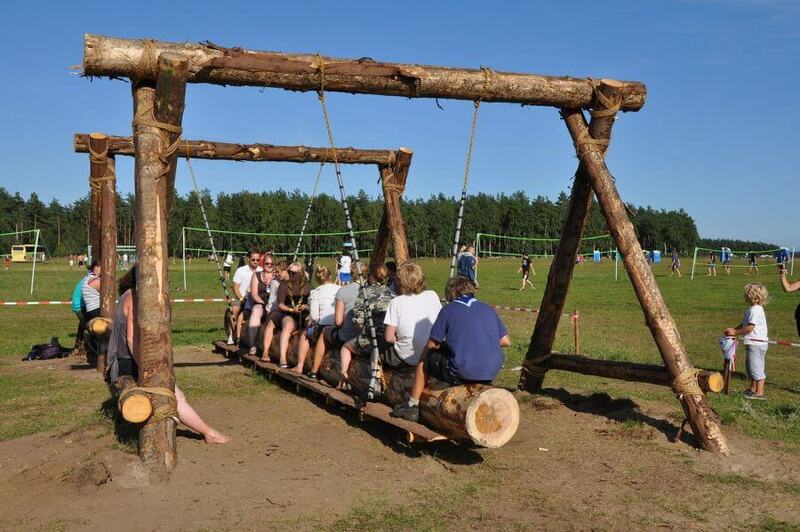 One of the best, oldest, camp games that no one knows how to play, even way back when it was a popular pastime. This old game is played with pocket knives, so if you have qualms about dinging your blade or getting nicked, move along. Hone your marksmanship in the most primal way: throwing rocks! Setup targets of some kind, traditionally cans but could be anything close at hand that will react when struck, and get to hurling. You can play a dozen variations on this, either for speed or points. HORSE is one popular variation akin to basketball, where called shots are attempted then duplicated by the opposing player. These games are ones that can be played on a piece of paper or other writeable surface. Everyone has played tic-tac-toe, right? Same thing, only we will play games a fair bit more enjoyable and, you know, actually gamey than tic-tac-toe. Another classic guessing game and one that still holds up well today. Players take turns choosing a secret word that must be guessed, one letter at a time, by the opposition. The controlling player has on a piece of paper a simple gallows and noose, and for each wrong guess a limb or body part is added to the hangman. This is one game I quite prefer on paper versus the live board game equivalent. Each player draws two 10×10 grids on a piece of paper, one representing their fleet and the other representing enemy waters. The vertical axis will be marked A through J, and the horizontal axis 1 through 10, allowing a grid reference to be called out. There are plenty of other games in each category you may enjoy, but these are some of my all-time favorites, and enjoyable by players young and old. Or you may perhaps create a game of your own. Entertainment for stress relief and bonding is a must during any protracted crisis that affords it. The human psyche is fragile, and without appropriate measures to reduce stress and increase positive feelings, even if only with a game of chance or skill and some companionship, morale may plummet and tempers flare. Learn a few card games, improvise a board game or two, and break out the chess set when time allows, and you and your mates will all be thankful for the diversion. It is really great to see someone else supporting the need for entertainment post event. I so often hear when I suggest this that there will not be any time for entertainment. As if there is never any downtime or even that relaxation is an actual need for good health. This is especially true if there are any children involved. While they will most likely have chores and assigned tasks to do, they will not, and actually cannot be expected to be occupied full time. So thank you for the article. Games that children enjoy, especially those you know the children in your group or family enjoy, can be obtained in both full size for home and travel size for on the move situations. Yes, the number must be pared down, and games with the least number of losable parts should be chosen. Along with the list in the article, I would include a set of (at least) five dice and a few small pads of paper and golf pencils. This will allow the playing of several dice games, including one of my favorites, Yahtzee. While preprinted pads are nice, it is not difficult, or even a real handicap to simply write and draw a list type version by hand on blank paper. Or, you can design one that you like, large enough to use easily, and print them. If you have a printer that will allow it, you can do them six to a page, and if you can double side print, six on each side for twelve copies on one sheet of paper. Either carry the full sheets, or cut the paper and make a pad. Include a golf pencil with each pad. While you do need paper and pencil, if you do have them available, creating stories and writing them down can be a good way to involve just about everyone. Including children. If paper is a problem, but you have a smartphone or tablet and a way to keep it powered, by adding a compact or folding keyboard, you can simply type in the story as it progresses. I would include a tennis ball if at all possible in the traveling kits. Playing catch is a great way to pass some time, and can often allow one adult or responsible teen to keep several children engaged for quite some time. For one adult or child, if there is any sort of solid wall around, bouncing the ball against the wall can serve the same purpose. And especially with children, playing catch and bouncing a ball off a wall helps develop physical dexterity, eye/hand coordination, and even a bit of geometry, trajectories, and physics. While I do not believe it is really suitable for use in the field during hazardous times, karaoke can be a huge benefit at fixed locations. And with the handheld karaoke microphones that use a smartphone or tablet as the screen to display the lyrics, it actually can be done in the field if it is safe to do so. Given a tablet or a computer that can be powered with any problems, the available karaoke software programs and apps allow one to have a full-fledged karaoke system without need for any special equipment, CD+G drives, or amps and speakers. The only extra, other than the software or app is that you might need a microphone, depending on the system, and how ‘professional’ you want your voice to sound. It is the equipment that makes people sound much better than they sound when just singing out loud. It has to do with echo/reverb and being able to shift the key. And some other things that are way over my head. But I do believe it would be well worth what little effort it would take to set. There are thousands of youtube karaoke videos, so any type of music can be had. One or two small items for each small child can be carried without too much problem. A toy car or truck or airplane. A small doll, a small teddy bear, a prized book. Anything to bring some normacy to the child will help. Go to archive.org and download all the Old Time Radio programs, they are not copyrighted and are free to download. Hundreds of programs from Sci-Fi, mystery, westerns and romance audio recordings. Gigabytes of them. When the weather is bad, the storm is raging and folks aren’t up to playing interactive games, gather around the MP3 player (that was protected in the faraday container) and enjoy. When the TV is just a box (as well as consuming great amounts of power), a small MP3 player with rechargeable batteries is all the evening / rainy day entertainment needed. Sherlock Holmes, Outer Limits, Lone Ranger – they are all there. Cribbage is another one. When I was in Scouts we carried cribbage boards in our backpacks with a deck of cards strapped to it. Two classic card games that seem to have fallen by the wayside are pinochle and euchre. As children, we spent hours playing both games with our cousins and neighbors, even holding weekly tournaments, with the championship game being played on Saturdays. Winner got bragging rights for the following week.